Advanced microsensor technology is making a significant impact in fields as diverse as wireless communications and automotive, biomedical and chemical engineering. 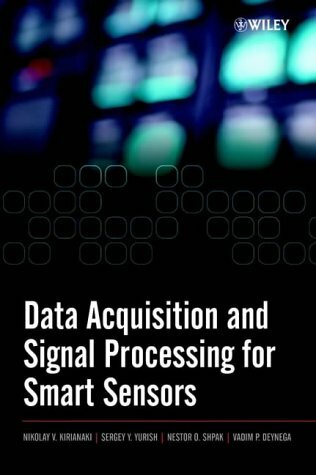 Data Acquisition and Signal Processing for Smart Sensors draws on the authors' collective practical experience in the design of sensor instrumentation to provide a systematic treatment of smart sensors and sensor systems. This unique reference presents an alternative to the classical approach to data acquisition and covers signal processing methods for digital and quasi-digital sensors. With coverage ranging from the detailed analysis of available conversion methods to software level smart sensor design, Data Acquisition and Signal Processing for Smart Sensors will have broad appeal amongst instrumentation and measurement professionals. Advanced students and researchers in microelectronics, engineers and developers of microsensor systems will appreciate the comprehensive treatment of this emerging area. ISBN: 0470843179, hardcover, 320 pages. Pubdate: 31 March 2002. Order off- or on-line. Chapter 1. Smart Sensors for Electrical and Non-Electrical, Physical and Chemical Variables: Tendencies and Perspectives. Chapter 2. Converters for Different Variables to Frequency-Time Parameters of Electric Signal. Chapter 3. Data Acquisition Methods for Multichannel Sensor Systems. Appendix. What's on the Sensors Web Portal ? Introduction to the authors' novel Method of the Dependent Count for frequency (period) conversion and measurement and its applications. Consideration of modern sensor interface circuits, buses, along with an introduction to the Universal Transducer Interface (UTI) and Time to Digital Converter (TDC). Methods of frequency-to-code conversion for smart sensors, including direct, indirect, combined, interpolation and Fourier transform based techniques as well as advanced and self-adapting conversion methods. Comparative analysis of smart sensor systems with time- and space-division frequency channeling functions. Detailed glossary of related terms accompanied by a guide to related web resources. 'Experts in the design of sensor instrumentation treat smart sensors and sensor systems, presenting an alternative to the classical approach to data acquisition and covering signal processing methods for digital and quasi-digital sensors. Coverage ranges from a detailed analysis of available conversion methods to software level smart sensor design and smart sensor buses and interface circuits. Material is of interest to instrumentation and measurement professionals, advanced students and researchers in microelectronics, and engineers and developers of microsensor systems. N. Kirianaki and S. Yurish are affiliated with the International Frequency Sensor Association (IFSA)'.Book News, Inc.®, Portland. 'The book has significant detail so that you can apply the principles and techniques shown with relative ease. Since the text goes from the basics to advanced techniques, it would benefit many practitioners, whether they are just getting into the field or are experienced developers who need detailed information for optimization of their approaches... In conclusion, this book provides a good basis for anyone entering or studying the field of smart sensors. It not only provides a good basis for the inexperienced practitioner but also could be very useful to those with some experience'. Review in IEEE Instrumentation and Measurement Magazine, December 2002. (Reviewed by Bob Goldberg). This text is a leading edge resource for measurement engineers, researchers and developers working in microsensors, MEMS and microsystems, as well as advanced undergraduates and graduates in electrical and mechanical engineering.